This book describes potentiometric methods for determining stability constants and explains how these constants can be used to describe metal ion speciation in complex environmental and biological systems. It also provides three original computer programs on a disk for calculating stability constants and for using stability constants to calculate concentrations of molecular species in solution. The author gives examples of calculations for simple metal chelates, for metal complexes of large organic molecules, and for mixtures containing several metal ions and complexing agents in aqueous solution. They also describe common errors in calculating stability constants and how to avoid them. This carefully revised second edition is now even more useful to the reader, and, in particular, to those who make use of the program disk. Each program has been revised to improve speed, control, and error trapping. Arthur E. Martell was a Distinguished Professor of Chemistry at Texas A&M University and award-winning researcher in the field of inorganic chemistry. His research centered on metal chelate compounds, macrocyclic complexes and cryptates. 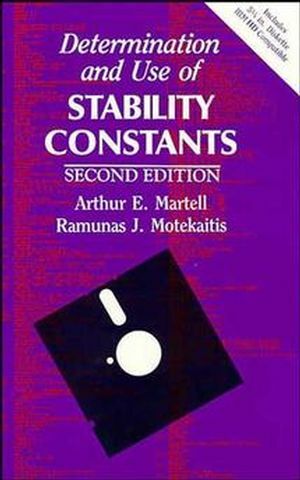 Ramunas J. Motekaitis is the author of Determination and Use of Stability Constants, 2nd Edition, published by Wiley.